After a 3% rise on Friday, China markets are soaring some 2.5% today. 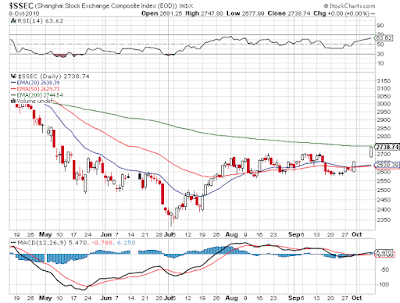 The Shanghai Index had been trading between 2600 and 2700 since late July and as of Friday it had finally broken above the range signaling a likely significant rise ahead. This is great news for bullish US investors as a breakdown the Chinese stock market and 2nd largest world economy could have doomed the US rally. 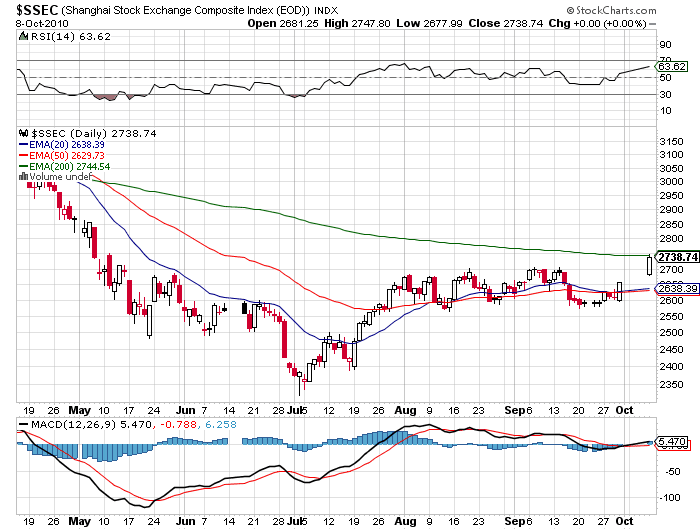 As of midnight in New York, Shanghai is trading above 2800. On Tuesday the index is likely to consolidate back around the 200ema of 2744, but any pullbacks should be bought. The chart below doesn't show today's action, but the 2+ month channel that has been broken to the upside. Chinese investors clearly came back from the holiday in a buying mood.